I'm holding on to the last legs of summer and cooking with fresh ingredients as long as I possibly can. That means I'm eating lots of salad and grilling outside as much as possible. Let's talk about using the grill to create a salad built to satisfy. If I'm going to eat salad as a main course, it better be filling, super flavorful, and loaded with protein. 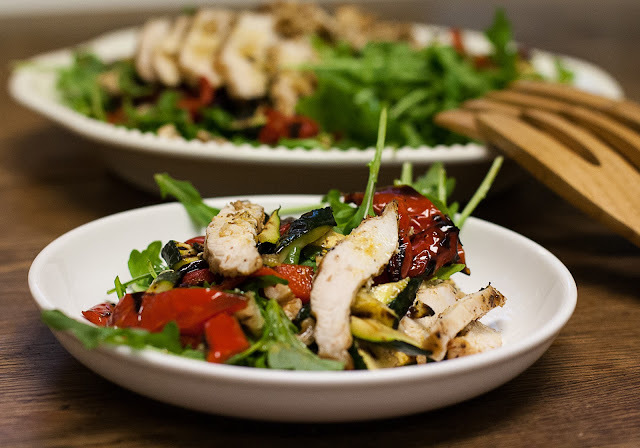 The grill helps to char and soften deliciously hardy vegetables to layer with spicy arugula, meaty walnuts, and perfectly juicy chicken breasts. It's layered with crunch, spice, and smooth textures creating a perfectly balanced dish. A salad made with flame? Good. A salad built to satisfy a hungry bear? Even better. For the dressing: In a small bowl, whisk together vinegar, garlic, Dijon, salt and pepper. Slowly whisk in olive oil until thick and creamy. Set aside. Rub chicken breasts with 1 tablespoon of olive oil, dry rub; cover and refrigerate for at least one hour, up to one day. Toss red pepper and zucchini with 1 tablespoon of olive oil, and sprinkle liberally with salt and pepper. Place vegetables directly on the grill. After 5 minutes, turn the vegetables and cook until they are slightly charred and cooked through, turning occasionally; about 15-20 minutes. Remove from the grill; cover with foil to keep warm. Place the chicken breast directly on the grill. Don't touch or flip for 4-5 minutes; allowing grill marks to form and ensuring chicken will not stick to the grill. Turn once and grill the other side; about 4 minutes. If the juices are clear, the chicken is done. Remove from heat and allow it to sit for 5 minutes. In a large bowl, toss arugula with half of the Dijon vinaigrette. Arrange arugula on a large platter. Roughly chop the roasted vegetables in to 1 inch chunks and arrange on top of the arugula. Drizzle with 1 tablespoon of the dressing. Sprinkle liberally with toasted walnut. 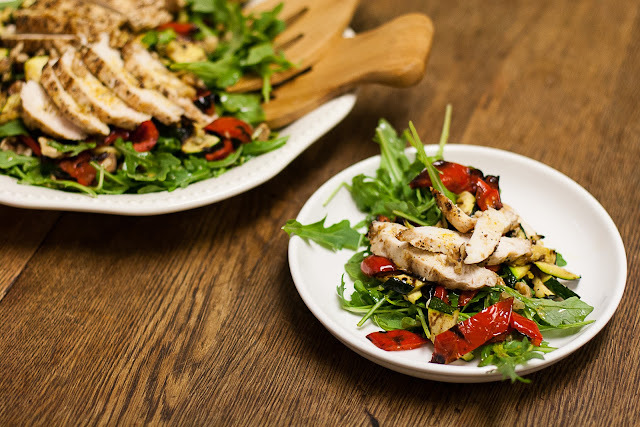 Top the salad with sliced chicken and drizzle chicken breast with the remaining dressing. The salad looks delightful. It goes really well with Dijon vinaigrette. 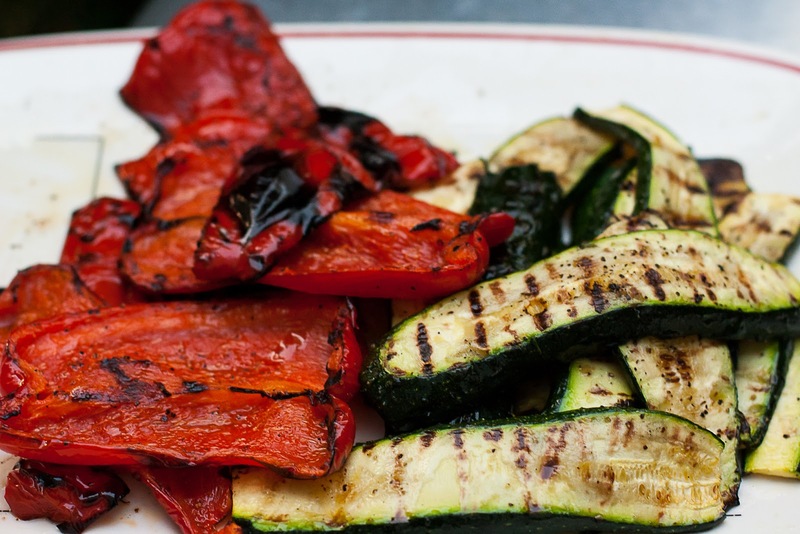 I adore grilled veggies - I would demolish this salad. You really are hanging onto the last legs of summer with this gorgeous salad, Kim! It's not getting away quite yet. You are obviously making the most of your grill. Delicious!